Turn Python into a scientific data analysis and modeling tool with these libraries. Because of its extensive usage, Python has a huge number of libraries that make it easier for data scientists to complete complicated tasks without many coding hassles. Here are the top 3 Python libraries for data science; check them out if you want to kickstart your career in the field. NumPy (short for Numerical Python) is one of the top libraries equipped with useful resources to help data scientists turn Python into a powerful scientific analysis and modelling tool. The popular open source library is available under the BSD license. It is the foundational Python library for performing tasks in scientific computing. NumPy is part of a bigger Python-based ecosystem of open source tools called SciPy. The library empowers Python with substantial data structures for effortlessly performing multi-dimensional arrays and matrices calculations. Besides its uses in solving linear algebra equations and other mathematical calculations, NumPy is also used as a versatile multi-dimensional container for different types of generic data. Furthermore, it integrates flawlessly with other programming languages like C/C++ and Fortran. The versatility of the NumPy library allows it to easily and swiftly coalesce with an extensive range of databases and tools. For example, let's see how NumPy (abbreviated np) can be used for multiplying two matrices. Let's start by importing the library (we'll be using the Jupyter notebook for these examples). Next, let's use the eye() function to generate an identity matrix with the stipulated dimensions. Let's generate another 3x3 matrix. We'll use the arange([starting number], [stopping number]) function to arrange numbers. Note that the first parameter in the function is the initial number to be listed and the last number is not included in the generated results. Also, the reshape() function is applied to modify the dimensions of the originally generated matrix into the desired dimension. For the matrices to be "multiply-able," they should be of the same dimension. Let's use the dot() function to multiply the two matrices. We managed to multiply two matrices without using vanilla Python. Pandas is another great library that can enhance your Python skills for data science. Just like NumPy, it belongs to the family of SciPy open source software and is available under the BSD free software license. Pandas offers versatile and powerful tools for munging data structures and performing extensive data analysis. The library works well with incomplete, unstructured, and unordered real-world data—and comes with tools for shaping, aggregating, analyzing, and visualizing datasets. For example, let's see how the Panda Python library (abbreviated pd) can be used for performing some descriptive statistical calculations. Let's start by importing the library. Let's create a dictionary of series. Matplotlib is also part of the SciPy core packages and offered under the BSD license. It is a popular Python scientific library used for producing simple and powerful visualizations. You can use the Python framework for data science for generating creative graphs, charts, histograms, and other shapes and figures—without worrying about writing many lines of code. 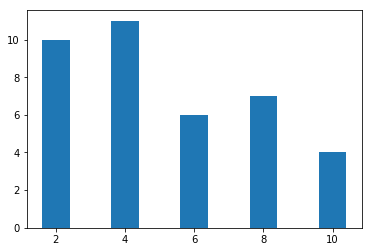 For example, let's see how the Matplotlib library can be used to create a simple bar chart. Let's generate values for both the x-axis and the y-axis. Let's call the function for plotting the bar chart. The Python programming language has always done a good job in data crunching and preparation, but less so for complicated scientific data analysis and modeling. The top Python frameworks for data science help fill this gap, allowing you to carry out complex mathematical computations and create sophisticated models that make sense of your data. Which other Python data-mining libraries do you know? What's your experience with them? Please share your comments below.